We’ve recently started using Google Wave here at 40Tech, and have found it be extremely useful, especially for site-related tasks. In fact, we wrote our first collaborative post using Wave recently. As useful as Wave can be, it can also be overwhelming. Once you’ve followed a few waves, your Inbox can be overflowing, making it very difficult to find what you want. How to tame this? For starters, you can organize waves into folders. But what if you want to organize waves by tag? Tags have some advantages over folders, including the fact that a wave can only belong to one folder, but a wave can possess multiple tags. Even if you tag your waves, however, there doesn’t appear to be a way to make your tags easily selectable in the sidebar. It might not be built into Wave’s UI, but there is in fact a way to get your tags into the sidebar. Read on for how to do it. This process will allow you to put tags in your sidebar, but it is really a workaround. 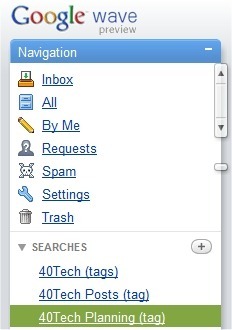 Your "tag searches" will be intermixed with any other saved searches. I cleaned up my sidebar by listing all of my "tag searches" first (the dropdown arrow next to each saved search lets you reorder your saved searches), and putting the word "tags" somewhere in the search title. This isn’t ideal, so we can hope that as it develops, Wave will add functionality allowing users to have a dedicated tag section in the sidebar. Are you using Google Wave yet? If so, are you using tags? If you’re not using Wave yet, and want an invite, stay tuned. In the near future we’ll be giving away a few Wave invites here at 40Tech. Do you have Wave, and are looking for a wave in which to participate? Stop by the 40Tech Public Wave, and say hi. .-= Rajesh Kanuri´s last blog ..Check Out My Exclusive Interview by Devang At SpeakBindas =-. Nice explained Article. it is very usefull. thanks for the share.